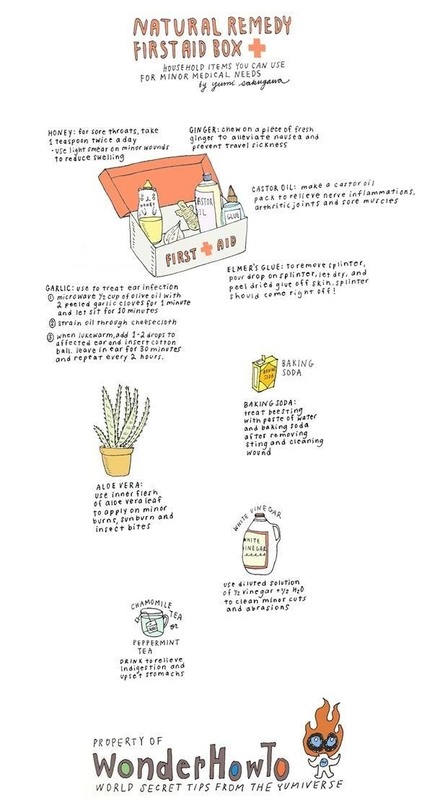 Itchy bee stings, sore throats, swelling muscles, minor scraps, splinters... all of these common ailments can easily be fixed with things you've probably got lying around at home in your kitchen and bathroom cabinets. Honey, ginger, castor oil, garlic, baking soda, aloe vera, white vinegar, and chamomile tea are all great natural remedies for your next minor medical need. No drugstore trips required (except for maybe some Elmer's glue). Tea fixes everything! I also like the aloe vera tip. I have a plant at home, and it's really useful to have around. I always thought castor oil was fake, for some reason. I don't ever remember seeing it in the grocery store. The others, I'll have to try for sure. Ugh I've had a couple splinters that I could not get out, and I tried so many internet rememdies ... wish I had seen this one using elmers glue! !